It seems as though no matter what he does, Jacob deGrom gets overshadowed by his fellow mound mates on the New York Mets. Matt Harvey has been nicknamed “The Dark Knight” while Noah Syndergaard goes by the moniker of “Thor”. 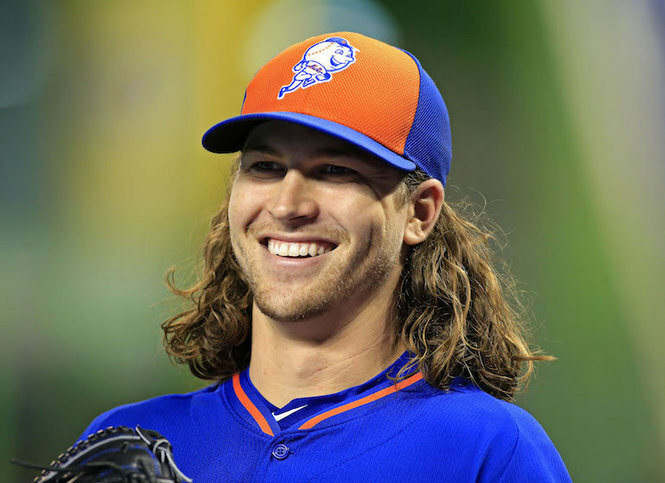 Yet, it has been deGrom who has avoided the injury bug and been the most consistent member of New York’s heralded pitching staff since winning the National League Rookie of the Year Award in 2014. Despite all of the perceived slights, there is one thing that DeGrom will always hold over his teammates: a dominating All-Star appearance. It was on July 14th of last year in Cincinnati when deGrom toed the rubber in the top of the sixth inning with the National League trailing 3-1. The hitters, in order, were Stephen Vogt, Jason Kipnis and Jose Iglesias. These three men proceeded to become the star victims in one of the most scintillating performances in All-Star Game history. DeGrom needed a mere ten pitches to blow away Vogt, Kipnis and Iglesias, a performance that captivated not only fans but the best of the best in Major League Baseball. Clearly running on adrenaline overdrive, his fastball topped out at 98 miles per hour. In all the years of watching the All-Star Game, I am not sure I have seen a more breathtaking moment than Jacob deGrom firing missile after missile. Let’s see Harvey and Syndergaard top that performance.